Issued continuously from 1887 to 1890, the Goodwin Company's Old Judge baseball series depicts hundreds of ballplayers from more than 40 major and minor league teams, as well as boxers and wrestlers. The cards measure about 1-1/2" by 2-1/2" and bear photographs from the Hall Studio in New York that were pasted onto thick cardboard. The sepia images display a white or pink hue, with "Goodwin Co., New York" at the base, and with each card blank backed. More than 4,500 different types of cards and variations are known to exist. 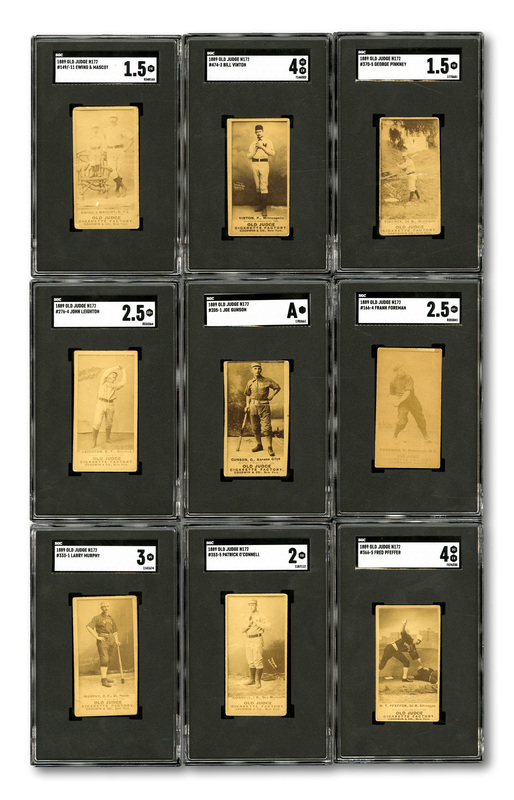 Old Judges exist with numerous variations; some individual cards have more than a dozen recorded varieties, including different poses, team affiliation or card text. The Old Judge cards are easily viewed as one of the greatest of all hobby issues. Included in this lot are 9 different Old Judge cards all graded by SGC. #149/-11 Buck Ewing(HOF)(Standing By Mascot On Chair) FR 1.5, #166-4 Frank Foreman (Cincinnati) GD+ 2.5, #205-1 Joe Gunson (Kansas City) AUTHENTIC, #276-4 John Leighton GD+ 2.5, #333-1 P.L. Murphy (St. Paul) VG 3, #353-5 Patrick O’Connell GD 2, #366-5 Fred Pfeffer (Tagging Player On Ground) VG-EX 4, #370-5 George Pinkney (Bat Over Rt. Shoulder) FR 1.5, and #474-3 Bill Vinton (Minneapolis) VG-EX 4. Only one of these extremely scarce Vinton versions has ever been encapsulated by SGC.